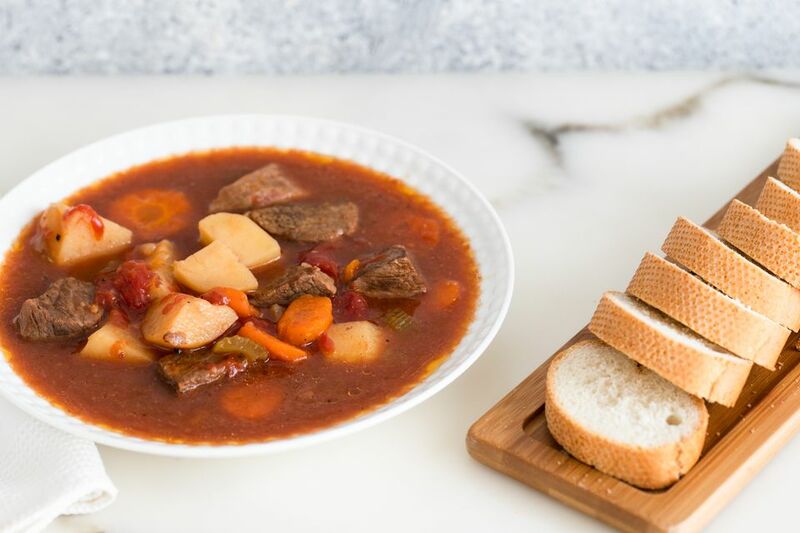 This easy beef stew gets fabulous flavor from the beefy onion soup mix and tomatoes. The stew has very little water in it, but as it cooks, the condensation adds more liquid. If your slow cooker has a tendency to cook faster, check and add more water, as needed. Serve this beef hearty stew with crusty rolls or biscuits for a satisfying family dinner. If desired, heat the oil or bacon drippings in a large skillet over medium-high heat and then brown the beef cubes. Put the beef (browned or not) in the slow cooker with the onion soup mix, bouillon, water, potatoes, carrots, celery, tomatoes, and garlic. Cover and cook on LOW for 8 to 10 hours, or until the beef and vegetables are tender. Add 2 tablespoons of cornstarch mixed with the 1/4 cup of cold water. Turn heat to high and stir until thickened.